L- The beer pours a slightly hazy golden. The head is two and a half fingers of white foam which recedes to a thin ring with large island. Lacing is present around the glass and lasts. S- The aroma is mild to moderate candi sugar sweetness and yeast must. T- The taste is less sweet than the nose. There is still a touch of sweetness which is cut by the mustiness of the yeast. There is light alcohol presence and some breadiness which lingers in the aftertaste. F-Mouthfeel is medium to medium full with some accompanying stickiness. Carbonation is light which accentuates the thicker mouthfeel. O- A more than solid, no frills, domestic triple. One that I would drink again. Pours with a one finger, white head that fades slowly leaving a good lace. Hazy amber color. Good carbonation and medium bodied. Nose is Belgian yeast, flavor is sweet, yeasty, bready some bitterness. $10.75 for a 22oz bottle from Lazy Dog Beer Shoppe Londonderry, NH. Bottled May 2016. 22oz bottle: This one pours a crystal clear golden color. There was a small white head that didn’t linger long. The nose has notes of yest, bread and a touch of sour/tart green apple. Faint spices. The taste is good. Some breadiness, yeast, light spices, faint sour apple and some graininess. A nice tripel. Having a small tulip pour at the Brewery right now. At least 12oz, perhaps 16.... glass is deceiving. Beer is a clear, medium golden hue.... Carbo is very light, as is the head.... just some small gatherings at the rim with light lacing. Nose has some bready, crackery malt with a touch of green fruit. Body is medium, and the prickle factor is low. Flavor is also crackery, with pear and green apple. Has a smidge of bubblegum, but it's acceptable. Finish is dry, with a suggestion of yeasty spiciness. A solid, tasty Tripel, though it would fall into the middle of the pack of Tripels I have had the pleasure to consume in Holland and Belgium. Prosit! Poured from the bottle into a tulip glass. Bottled May 16tth 2016. Slightly hazy body appearance with a presented fourteen carat gold color. Decent enough clarity to witness a great middle column of carbonation. Head creation is a bit small, but consistent. Bright white head in color, with a creamy simple top. Nice looking tripel. Lots of dry barley like aromas on the nose, with some faint sucrose, and almost sour peach to apricot stone fruit like tones. A good bready aroma kicks in with some nice density on the malt base too. Decent aroma. First sip is a great vanilla flavored creamy feeling palate. Rich malt with some excellent fruity esters that are quite unique. Tangy apricot and melon with an almost soft bitterness which is complimented by just the right amount of honey and malt like sweetness. Mild spicy phenols round out on the finish with some good faint touches of heat and clove, balancing and taking turns nicely. I am just shocked at the low ratings from previous reviews on this beer. The brewers nailed the true Tripel style here. This beer tastes like it was brewed and imported from Belgium. Westmalle would be proud. There is tremendous complexity with an amazing aftertaste, complex in its own right. Poured from the standard 22 oz bottle - with a bottled on date of 7-27-15 - into a Chimay goblet. The 9.2% ABV is there for sure, but it does not overwhelm. It took me one sip to realize how special this beer is. 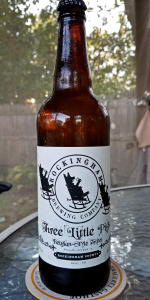 I have been very impressed with all offerings Rockingham Brewing Company has produced as they are quickly becoming my favorite NH brewery. Seek this one out, sip, and enjoy. Interesting take on a Tripel... This pours a slightly hazy gold with thin, but persistent white head that clings nicely. Aroma is malty and straightforward with some spice. Not as yeasty as expected, the flavor is decent - malty and slightly sweet with a peppery finish. A bit more alcohol than expected comes through, and persists into the aftertaste though. This stuff is okay. Picked up from McKinnon's in Salem. Good to see these guys getting more out there! From the 650 ml. bottle dated 07/07/15. Sampled on September 20, 2015. The color is a cloudy amber-yellow with a modest off-white head that settles back after a few minutes. The aroma has a modest toasty character with a bit of a pepper and spice punch. However, I also pick up the booze in this 9.2% ABV beer. The body is light and about right for the style. Same spicy flavors in the taste with a lingering peppery finish. Except for the booze this was a good Tripel. I bet it would mellow nicely after a year. On tap tonight at the distributor showdown at Cask and Vine. Best Belgian Trippel I've had outside of Belgium (and I worked for a Belgian company and went there at least four times a year).